As the Korean War ground to an uneasy close in July 1953 with the armistice signed by the United States, North Korea & China, American GI’s planned their trips stateside to reconnect with loved ones, to stretch out in their own beds, and to enjoy the absolute luxury of grilling hamburgers in their own backyards. Left behind were the culinary remnants of troop warfare: tons of canned rations left at Army bases. Some items had been introduced for the Korean War but others were on the hit parade for a second conflict, retreads from World War II: frankfurters and beans, spaghetti and meatballs, dehydrated cheese, and the bane of American soldiers’ foxhole dinners: George A. Hormel & Company’s fatty potted-meat product in a tin, called Spam. There are two reasonable schools of thought as to budae jjigae’s origins, both offshoots of the same situation. The post-war Seoul economy was in dire straits indeed, and there was still an American peace-keeping force present in South Korea. Kim Jong-sik, a Korean army veteran and proprietor of Bada Sikdang, a Seoul restaurant that specializes in budae jjigae, remembers that children would scavenge through dumpsters near American army bases for leftover Spam, hamburger patties, hot dogs–anything edible–and would peddle them to local restaurants. Also, Heo Si-kook, owner of Odeng Shikgang, one the oldest restaurants of this type in Seoul, recalls that many Koreans who worked on Army bases would smuggle out cooked leftover meat—which was going to be thrown away eventually–and asked Heo to make something out of it for them. 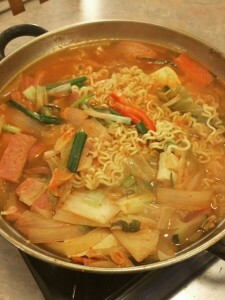 For a soup or stew, she added kimchee and gochu, Korean red pepper. It sounds like the stuff of urban legend, but nevertheless may be close to the truth in revealing an embryonic version of budae jjigae. 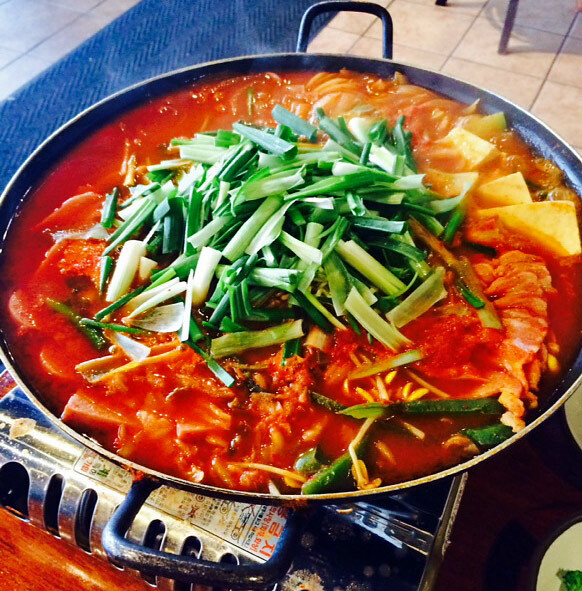 To neophytes being introduced to the complex and marvelous world of Korean cuisine since its migration to the U.S., budae jjigae would not be the training wheels on the bicycle. Better to be brought in slowly at first, to the wonders of bulgogi and kalbi, the marinated meats so popular at the Korean BBQ joints, or to the delightful variety of banchan, the pickled vegetables and appetizers served in multiple small bowls with every entrée. But to Koreans of that long-gone era—and to their descendants now—budae jjigae and other fiery soups and stews are their culinary backbone and serve as unrivaled comfort foods. 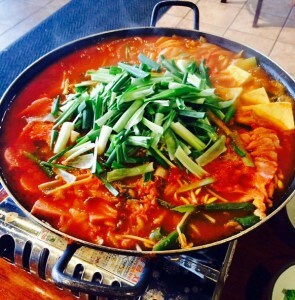 I ordered budae jjigae by accident at HwangDaeGham in Mundelein one snowy day, and fell in love immediately. 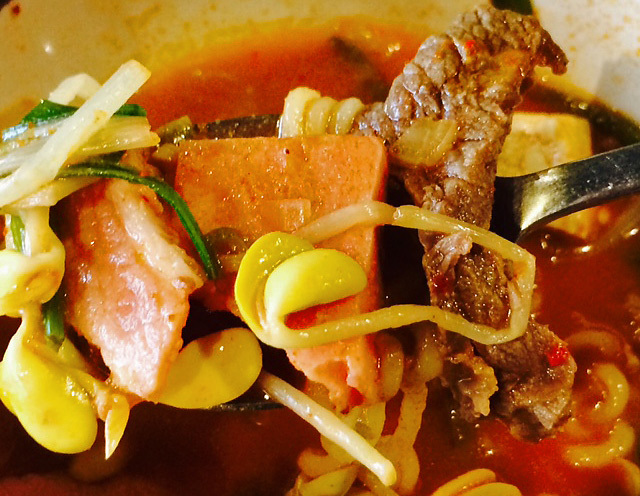 To my cold body, it was as warming as Jewish chicken soup, Vietnamese pho or Mexican pozole. 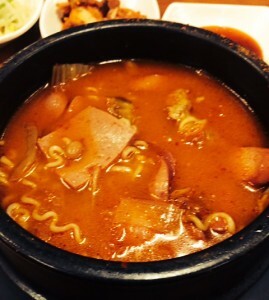 At the time, I had no idea of budae jjigae’s history & origin, and obviously wanted to find out more. This stew begins with seasoning paste, which consists of garlic, red pepper paste, red pepper flakes, sugar, soy and water. A kelp and mushroom-based stock is boiled, then pork belly is added. The stock is boiled some more with salt, then is transferred over to the type of portable wok-like pot with a Sterno-controlled heating element that is ubiquitous in traditional Korean restaurants. Then, depending on the version being created or the chef assembling, a litany of disparate ingredients can be introduced: cabbage, onion, green onion, thick-cut bacon, homemade kimchee (fermented cabbage), thinly-sliced rice cake, sliced hot dogs, Spam, Polish sausage, or a dollop of baked beans. This is deftly turned over with a large metal spoon in the now-bubbling cauldron, along with the final, weird coup de grace: a square of ramen noodles and, sometimes, a single slice of American cheese, which disintegrates promptly into the broth. For a few minutes before serving, the vapors emanating from this concoction are intoxicating—a vinegary, meaty, nose-running aroma from a chef seemingly gone mad. The interesting thing about my voyage through Chicago & north suburbia in search of budae jjigae was that first, it wasn’t always on the menu, so it didn’t appear to me to be that much of a staple of Korean cooking. And when I did see the dish, it was often served only for two people and called jeongol, loosely defined as having “many ingredients.” This also meant that, being a solo diner, I was bringing home leftovers most of the time. However, that proved not to be a detriment in the least as I was able to reheat this dish for a second and sometimes third re-evaluation, to confirm my tastebud memories from the days before. Quite nice, actually. Yes, it was quite a journey. 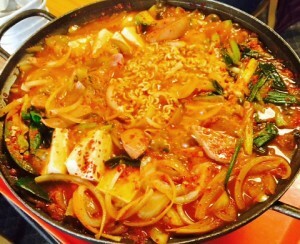 But I could almost tell upon initial taste if budae jjigae was an oft-ordered dish at that particular restaurant or not. 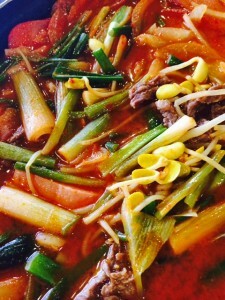 For instance, at Hal Mae Bo Ssam in Morton Grove, although the meaty broth was satisfying, the dish as a whole was not the complex amalgam I had read about and craved—it was totally uninspired, and disappointing. I inevitably scaled to that pinnacle, however, first at GNR Da Rae Jung on Lincoln Avenue in Andersonville, thanks to a tip by LTH poobah Ronnie Suburban. I enjoyed their interpretation immensely. In true GNR fashion, Da Rae Jung is no more than a nondescript strip-mall storefront that will never, ever be confused with high-porch dining. The small menu describes ”boodae chigae” as “kimchee, pork, ham, sausage, cheese, ramyun noodles, tofu, spicy soup.” A mere listing, but quite the understatement of fact and purpose. The taste? At times, when my spoonful included hot dog, ramen noodles and that creamy broth, it at once evoked memories of a similar flavor combination from my childhood. The remembrance was of macaroni-and-cheese with sliced hot dogs, which I recalled eating out of a bowl in front of our black-and-white Zenith TV set while watching Channel 9’s “Family Classics.” Other bites didn’t recall anything but complex flavors—believe me, Spam had never been treated so well. With its porous texture, which like the medium-firm tofu soaked up the intricate broth, it definitely improved the overall flavor. Finally, at San Soo Gap San, I found nirvana. The waitress was skeptical that I’d be ordering this two-person budae jjigae for myself, and kept pointing to the price on the menu, which was in the high twenties, saying “You OK with that?” I assured her that it was no problem, I’d be taking much of it home. 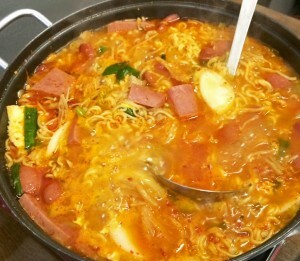 One other thing: I learned how to regulate the portable cooking contraption, turning down the fire if I thought that the broth was evaporating too quickly but then ramping it up when I was about to spoon out another bowl—budae jjigae needs to be eaten while steaming hot. And I wasn’t about to depend on the waitress to assist me, since she had probably already determined I had gone over the bend by ordering this. But I had the last laugh: its leftovers provided me sustenance for two-plus days, with the taste profile actually improving over that time. Amazing stuff. The marriage of flavors and textures—the Spam and broth, the ramen and bean mung sprouts, the pork belly and scallions, and each individual ingredient on a spoon with the cool, varied banchan—was extraordinary. How true. If it’s so wrong, it must be right. Andrew doesn’t know what he’s missing. Jay Martini (jnm123) grew up in the near Chicago suburbs, but always considered the city and its vast array of ethnic cuisine home. Working as a delivery boy for a Cantonese take-out during high school, he studied the chefs over their woks and learned. As a parking attendant for one of the first Japanese steak houses in Chicago, he loved the homemade sukiyaki made for the staff at the end of the night. And he’s gone on from there, gaining food knowledge through his domestic travels and cooking classes abroad. It’s a way of life for him.